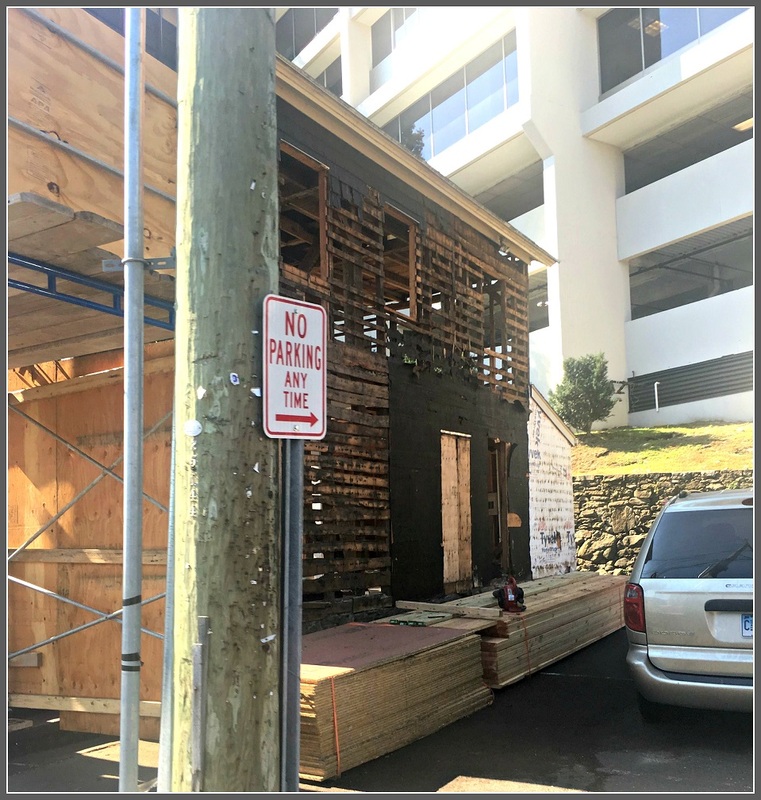 1 Wilton Road — the little building huddled beneath the massive Wright Street office complex, at the traffic-choked intersection with Post Road West and Riverside Avenue — has a long history. Built in 1830 — before Westport was even incorporated, when horses watered at a nearby trough — it’s a reminder of days gone by. 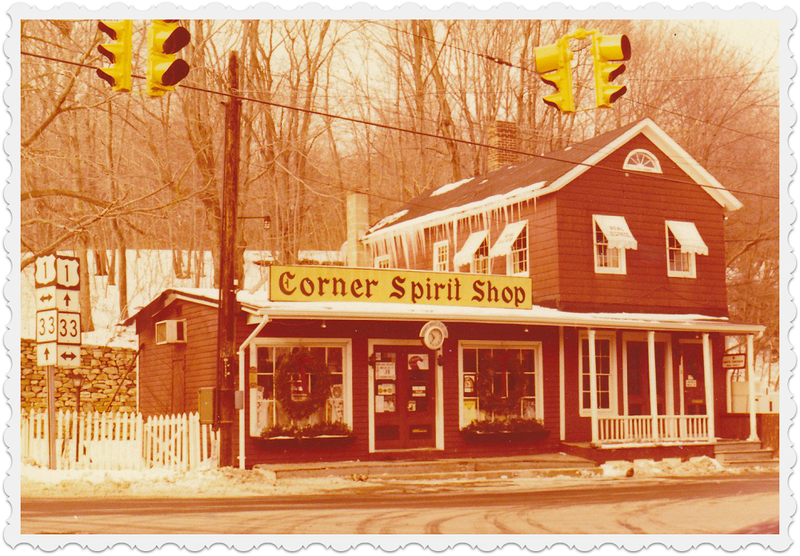 Originally a home, it’s been in recent years a liquor store and yarn shop. Now it’s home to Vita Design Group. The modern design firm’s projects include the Geiger development across from Greens Farms Elementary School, and the new glass house on Compo Beach Road near the Minute Man monument. Alert Westporters recently noticed scaffolding around the 1 Wilton Road site. Some wonder whether it’s coming down. Lucien Vita said his company spent its first years roaming around Westport. After starting in his home, Vita Design Group moved to several locations, including Main Street. As a small business, they saw the 1 Wilton Road spot — with plenty of traffic (and everyone stuck at the light) — as a marketing opportunity. They bought the property 4 years ago and planned a renovation, showing off what they do best. Permits took a while. Just before renovation was to begin, David Waldman and Greenfield Partners approached Vita with a plan. Together they own the former Save the Children property, across the street down Wilton Road. They planned a retail/residential complex there. To mitigate traffic concerns, they wanted to purchase 1 Wilton Road. They’d reconstruct that building on the Save the Children site; in return, they’d give the 1 Wilton Road land to the town, for a much-needed turning lane onto Post Road West. An artist’s rendering of the proposed new office building (center) and condos (right) on the former Save the Children property, as seen from Parker Harding Plaza. The Post Road bridge and National Hall are on left. It took 2 1/2 years, but finally the Planning and Zoning Commission said no. Though Vita was paying carrying costs each month for the property, they still wanted to help the town. They had a new idea: rebuild the office further back on the land. They’d keep its historical identity, yet still provide room for drivers to turn. However, it could take 2 years to work out funding. And if that came through, a town or state body could deny permission for the plan. It’s not feasible for Vita to wait. So — as the scaffolding shows — they’ve begun to renovate 1 Wilton Road for their new home. Plans include rebuilding the 1-story portion with a steeper roof, and putting new siding and details on the 2-story wing, integrating its historical features with a slightly modern touch. The inside will be gutted. Its original post-and-beam structure has been covered up. That will be exposed again, in a nod to its nearly 200-year-old past. That’s still not the end of the story. Vita says that even after renovation, he’s open to moving the building back — so long as that’s a practical, cost-effective solution. Dream about that the next time you’re stuck at that interminable light. For decades, Swezey’s Jewelers was a favorite downtown destination for Christmas shoppers. They didn’t all buy diamonds or watches. 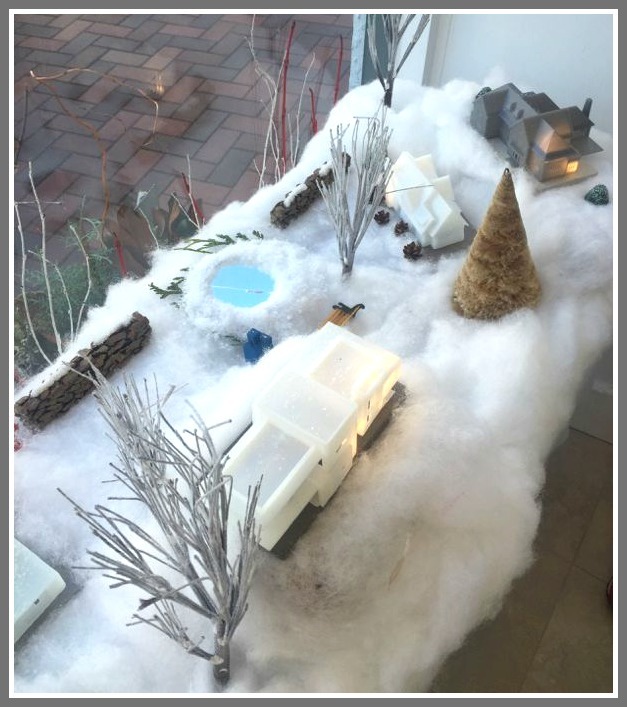 But everyone loved the winter scene lovingly created in the large storefront window, complete with an always-chugging model rail train. Swezey’s is now Jack Wills. Model trains are out; “Mortal Kombat” is in. But this year, strollers enjoyed an intriguing — if smaller — winter scene, on the same side of Main Street. Vita Design Group‘s display included an ice rink, skaters, benches, trees, and 3D-printed examples of a few Vita-designed houses. A view from inside of Vita Design Group’s winter scene. The display was the work of Gaelle Dudley. You may not have heard her name. But you’ve seen her creations all around town. Gaelle’s business is GLDesign06880. A home and business interior and exterior home design firm, it — that is, she — is responsible for the planters and outside “look” of popular spots like Granola Bar, She la la, Joyride and Fitness Factory. Gaelle is exactly what you think of when you hear her tagline: “live beautifully.” Young, lovely and energetic, she comes by her design chops naturally. A dual citizen who was born and raised in Paris, Gaelle embodies sophistication, elegance and good taste. But her career path was not always smooth. And “the good life” has not always been great. After majoring in business at Skidmore College, and joining a startup during the first internet boom, Gaelle entered the corporate marketing world. She worked for KPMG and Starwood Hotels, and had amazing experiences. But last year, she was diagnosed with cancer. Sitting at her desk after leaving Sloane-Kettering one day, she decided to make a life change. She began offering freebies — planters and containers — to friends. Quickly, the word spread: Gaelle was good! 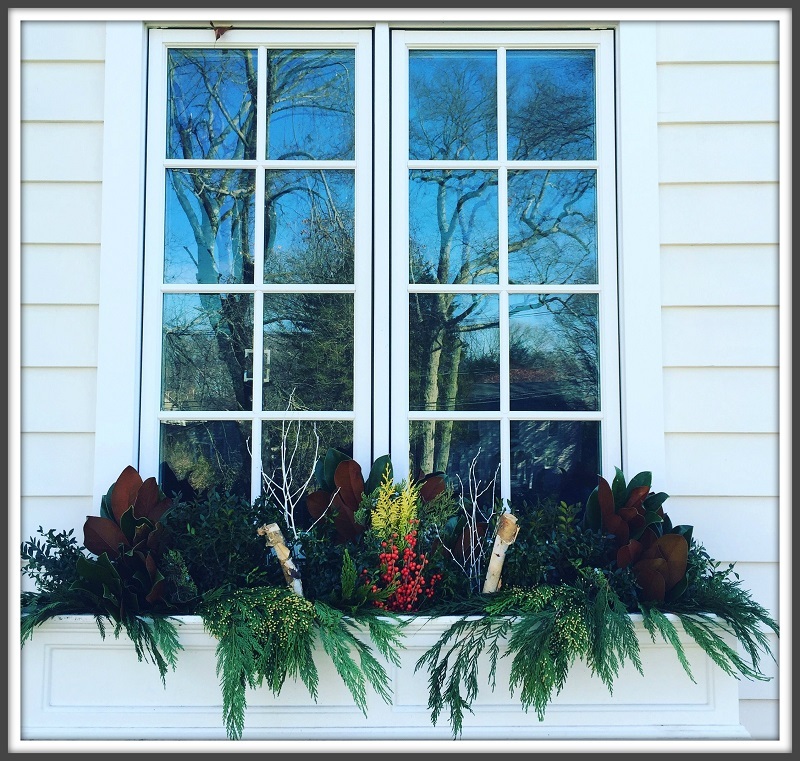 A window box by Gaelle. She’s also resourceful. 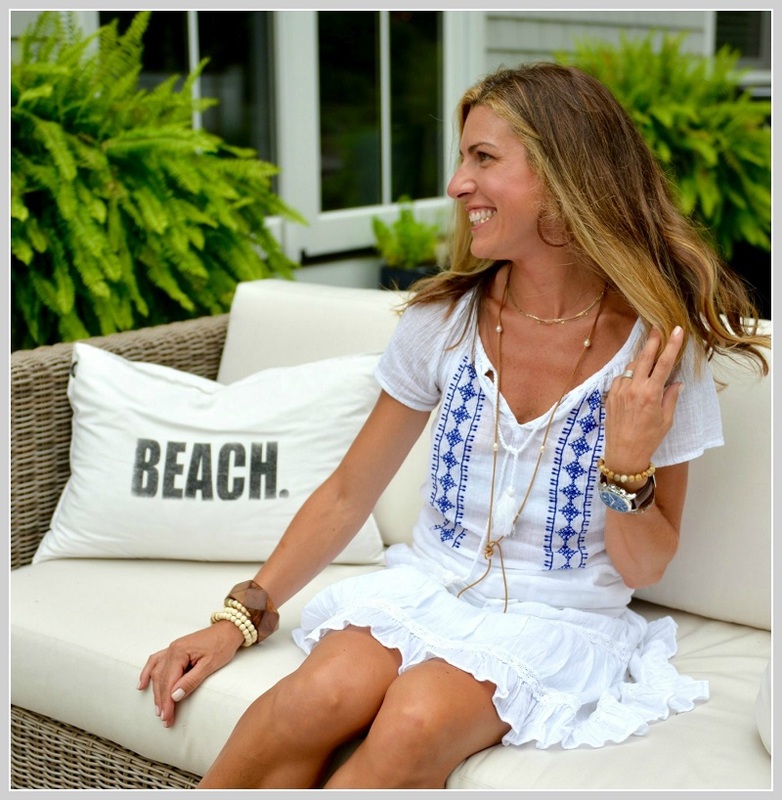 She sources nurseries and stores from Port Chester to Bridgeport. She does not mark up, or make a profit on, materials. What she does do is add personality and color to homes and businesses. She loves enhancing curb appeal. Indoors, for example, Gaelle transformed a drab attic into a beautiful playroom. 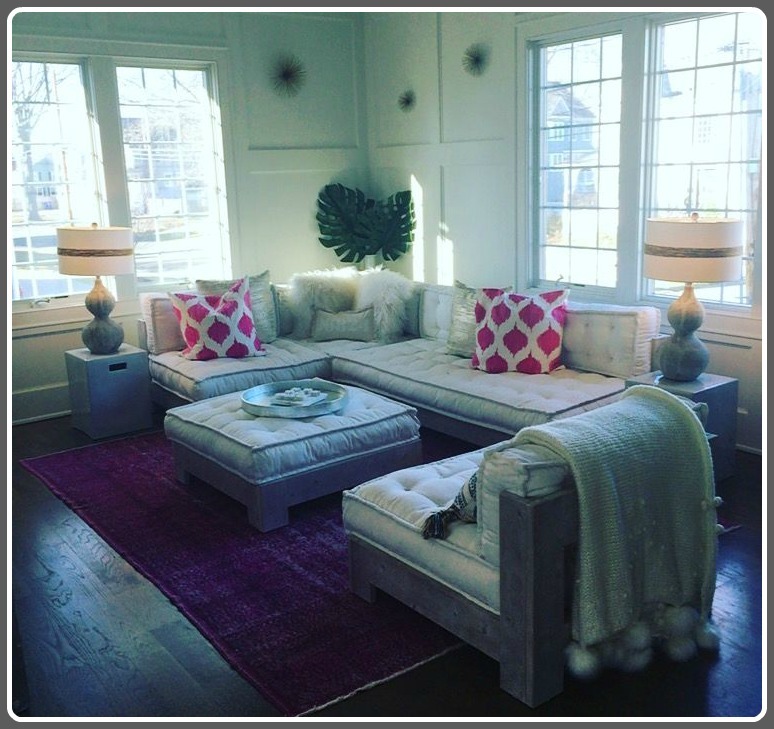 She created a reading nook, a boys’ nook and a girls’ nook, and painted the ceiling. “I bargain hunted, packed up my car, went over and made it look like a million bucks,” she says. After a career in marketing, Gaelle loves working with her hands. “This brings me such happiness,” she says.